Starring: Sylvester Stallone (Rambo), Jason Statham (Crank), Liam Hemsworth (The Hunger Games), and more. 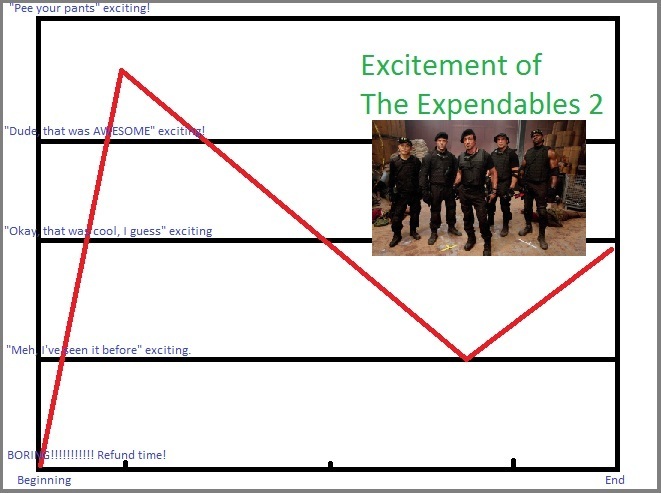 Remember when you heard of the first Expendables movie? So many stars, so many explosions, so much muscle. Why didn’t this film ever exist in the 80’s and 90’s during the peak of the actors’ careers?! Why was this an afterthought? Why did they wait until a time when the very idea of a roundhouse kick may have given some of the stars a hernia? After watching the first one, it left some of us knowing exactly why such a film didn’t exist earlier and left others of us wanting more. 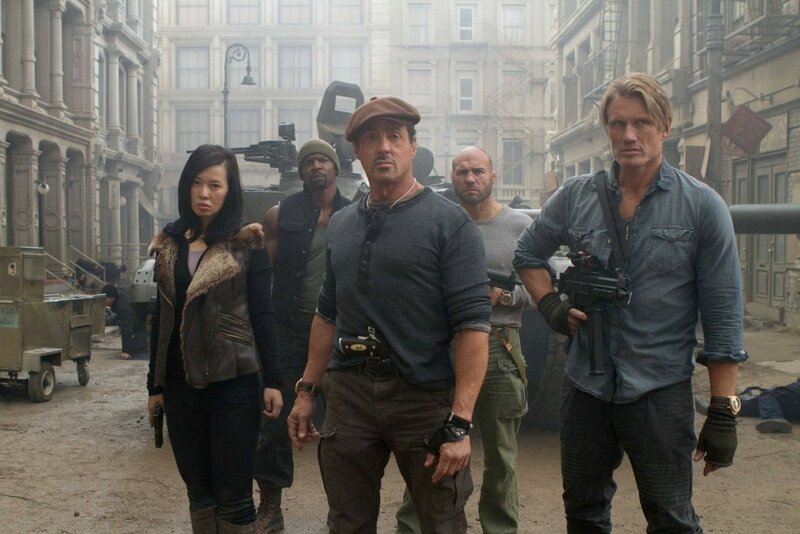 In The Expendables 2, Sylvester Stallone reunites the crew (well, most of them, anyways) in this highly explosive sequel to the 2010 muscle-bound collaboration. Some of the action genre’s best icons, including Chuck Norris, Jean-Claude Van Damme, Arnold Schwarzenegger, Bruce Willis and more share the big screen in this “old guys with guns and muscles” club with welcome newcomer Liam Hemsworth. While not necessary, it helps to have seen the first (and admittedly better) Expendables film for foundational character and story info. The Expendables 2 begins immediately with an action-packed sequence full of excitement, cameos, bullets, blood and “brawn buddies.” Unfortunately, the excitement level peaks there and the film rides on very little aside from continued fun cameos here and there along with cleverly placed one-liners and famous phrases. 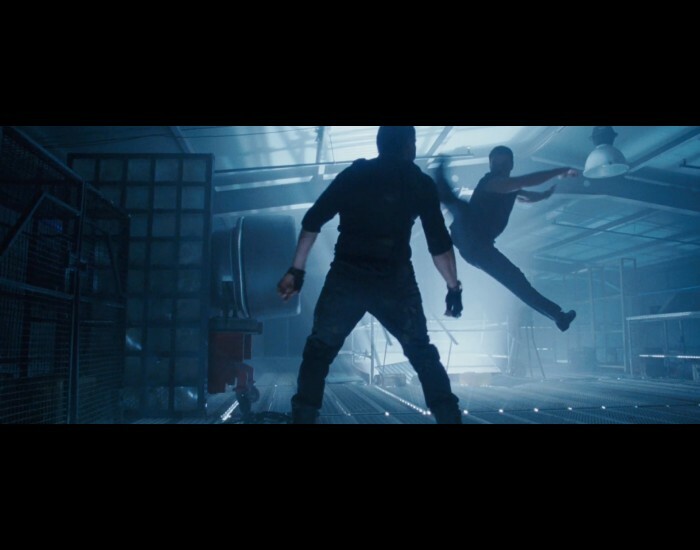 Both the plot and the dialogue end up less than expendable, but the fun of the film lies solely in watching the action experts do what we know them best for: rolling into a scene with guns a-blazing, cheesy one-liners, great choreographed fighting and sweating with swagger. Not known for their acting skills, the crew still manages to make most of the film fun. Jean-Claude Van Damme plays the believable villain (He definitely should be a villain more often! ), Chuck Norris’ limited scenes are on the mark, and the Schwarzenegger/Willis/Stallone scenes are loaded with smirks and smart remarks. 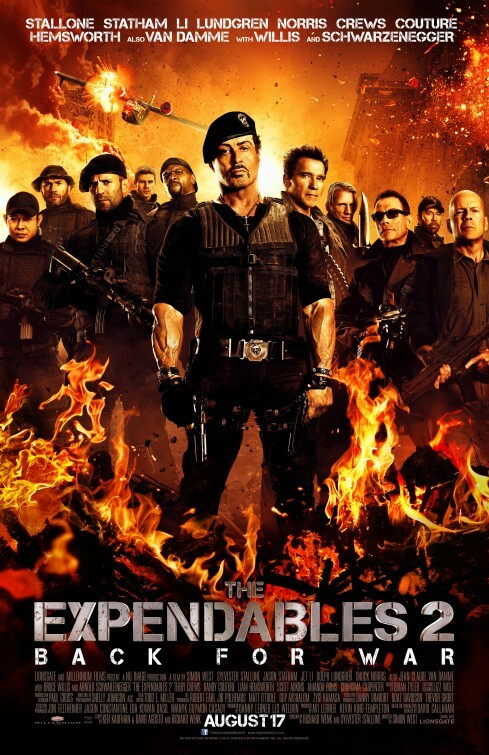 If you are a fan of the first film, or a fan of the action genre giants, you will enjoy The Expendables 2, especially for the signature moves and phrases. The plot, full of holes, is quickly ignored amid the fun that the film brings (and pokes at itself at its own expense). I mean, come on, did you really expect this film to be the drama of the century? Nooo! It’s Rambo, the Transporter, The Terminator, John McClane, the one and only Texas Ranger, The Universal Soldier and more. Even the one main female cast member (played by Nan Yu) can put a hurtin’ on the baddies. She’s not there for the lovey-dovey drama! Loaded with multiple references and character shots, it makes for a tough guy comedic tribute. 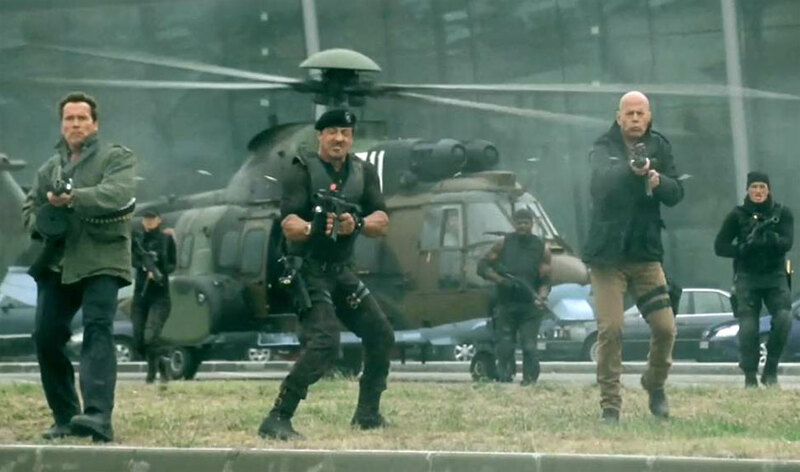 Though not nearly as fun or memorable as the first, The Expendables 2 is loaded with explosive fun and action for fans of the genre to enjoy for the cheap thrill that it is. Lock and load up your plate as you satisfy your action hunger with this film served up by Stallone and company! I just couldn’t bring myself to give it any higher than a 3. I had to respect my rating system. haha. yeah, I had to sit down and iron out the details for myself a while back. It helps keep things standard I guess. No 3.5 from me. sorry. haha. While the muscle mass is great, I found myself quite bored in the middle and would hope that a “B” movie like this with this many stars would still keep my attention regardless of plot holes and unnecessary characters. It was fun though, and for that reason it gets an above average score! After reading your review I was expecting a much lower score. Personally I really didn’t like the first one as much as I did the sequel. Really loved the way the kept making fun of each other and my favorite bit has to be the Schwarzenegger/Willis bit towards the end. It still was fun. A lot of fun. But I remember enjoying the first one…perhaps the novelty of all the guys together for the first time…and the plot was a little bit better for me. I remember there being more time for each of the stars whereas in this one, not so much…I mean, what happened to Jet Li? Where did he go? I liked your chart. Are you sure its not more fun than the first? Because that one wasn’t a whole lot of fun, to be honest. I enjoyed the first more. truly. As I mentioned to Nostra, there was just more time for each character and we got to enjoy them. The novelty of the first time these guys were all together was there, and it just was tons of fun. This one is fun at the beginning with an opening that makes almost no sense at all,but is just FUN. It kinda fizzles a bit and then brings it home with the fights we all want to see. But nothing nearly as cool as when Terry Crews used that gun to blow that guy in half in the first one! That was wicked crazy! I also think that the The Expendables 1 was a better movie. I really don’t even know why they would ever make a sequel. The first was a novel idea, and was well executed. I re-watched it through my Dishonline account the day before I went to see The Expendables 2, and I enjoyed it even more than the first time I saw it. However, when I went to see the sequel with a couple of co-workers from Dish we all thought it came across as hackneyed, not funny. Hi Chris! Welcome. Thanks for reading and for commenting. was there a part in this sequel that you did enjoy? I liked the Stallone/Van Damme matchup. and Chuck Norris was funny. Ahah, I like your excitement chart, nice touch! I often see that in one of those British movie magazines, a good way to measure the pacing of a film. Wow, a 3/5, seems like this sequel is quite an improvement over the first in that they at least poke fun at themselves more. I was hoping they’d make it more humorous with the first one. I gave that one a half star so can’t imagine anything would be worse than that one, ahah. hahaha. Thanks Ruth. I thought it up right after watching it and decided I had to make it and put it in the review. I remember you not liking the first one. I’m not sure what you will think of this one. I liked the first one myself, but the sequel didn’t impress me as much. I enjoyed it more than you, but maybe I just have a higher tolerance for seeing these guys in action. Because it definitely is repetitive. There’s no doubt. ha. I had to do it! So much fun. It’s how I felt about the film. the movie was fun, I just wanted more from the guys. Like you, I was glad for the Van Damme written final fight scene! I thought JCVD was great as a villain, he definitely was born to play the baddie! I wasn’t sold on Chuck Norris though. After spending an hour with all these gruff, ‘roided up He-Men he came out with a pretty wimpy, high-pitched voice and I totally deflated. And while I thought Maggie had one good fight scene, she really WAS there for lovey-dovey drama. What was up with that?! ewww ugh. Flirting with Sylvester Stallone? And for what reason? just, gross. Hello Tippi! Thanks for chiming in. Glad to have you here. I know what you mean about Norris, but I will tell ya it served as a nice break from the muscle monotony if you will. I didn’t really think Maggie was flirting so much until prob the very end, but it didn’t gross me out. haha. oh she was definitely flirting; remember the “I could go for some Italian” comment?! ugh. It mostly grossed me out because it was so unnatural, and it was obviously just written in because it’s an action movie cliche. It’s like Chekov’s Gun: If there’s a woman in an action movie, she WILL be with/attempt to be with a man. I actually really enjoyed Terry Crews for some reason; he had a relatively small part and just enjoyed the hell out of it. His quips were some of the best, I thought! Ah, yes, I do remember that line. I forgot. haha. You’re right. I wanted more from Terry Crews as well and was disappointed. I, admittedly, was a little more bored in this sequel than in the original.